After you have added remote server in MSPControl you should configure its services. Think "Services" as an applications installed on remote server that should be controlled via MSPC and available to end-customers. Each service is characterized by provider type (the name/version of the application it can work with) and all services are grouped into resource groups (OS, WEB, FTP, MAIL, etc.). Before registering server service its corresponding application should be installed and configured on the server. In order to register a new service click "Add" link in the corresponding resource group. Specify the display name for the service and select service provider. 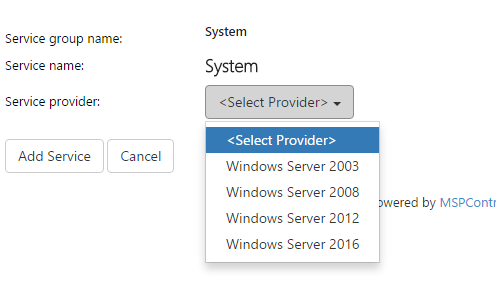 The values in Service provider dropdown depend on the selected resource group. Select the provider that corresponds to the installed application. Click "Add Service" button to add the server. After that service properties screen will be displayed. Its appearance depends on service provider selected on the previous step.